In the intense world of street art, Blek le Rat's work is a breath of fresh air--ironic considering he's stood at the forefront of the movement for over 30 years. Xavier Prou a.k.a. Blek le Rat, is the Parisian born artist who's been perfecting his unique brand of stencil graffiti for three decades. Blek Le Rat is celebrating his 30-year anniversary of making art in the streets this year with a retrospective coffee table book and gallery exhibitions across the globe. As one of the most prolific stencil graffiti artists Blek has been applying his trademark rats and iconic imagery since New Year's Eve 1981. The wildstyle graffiti he saw on the streets of New York City in the late 1970s served as the inspiration to develop his own unique brand of pochoir imagery and his work has influenced many of the most celebrated contemporary artists including the infamously anonymous graffiti artist Banksy, who in 2006 said, "Every time I think I've painted something slightly original, I find out that Blek le Rat has done it as well. Only twenty years earlier. . ."
Blek le Rat's style of graffiti was so different from what he'd seen in New York, that it took a year before he was prepared to begin himself. Carlo McCormick, senior editor of Paper Magazine writes, "By his own account, it was as a teenager visiting New York in 1971 that Xavier Prou had his first experience with graffiti that would in time redirect him to begin producing his own images using stencils on the streets of Paris. Taking this as factually true, it is certainly valuable information. For the historian however, it is so utterly incomplete that to imagine, based upon this single event Prou miraculously transforms into Blek le Rat a full decade later is as shockingly misguided as it has been for others to think that Banksy appeared out of thin air without the foreknowledge of Blek Le Rat's career afore hand." Blek le Rat uses characters to make a statement or communicate an idea. What makes his work stand out is that beauty seems to be equal or paramount to the message and integral to the conversation his work aims to evoke. Relying on irony and satire, Blek employs strong imagery that stays relevant over time. Each Blek le Rat stencil is painstakingly rendered, and lovingly applied to wall, paper or canvas. His work is graphic and dynamic and his characters seemingly alive with the poetic intention he imbues within them. Armed with pride in his French heritage, Blek le Rat's compositions possess a distinct European elegance and move within their boundaries in a way that is without peer. His figures, often reminiscent of mythological characters or people depicted in ancient artwork, embody a timeless and ethereal quality in spite of their ephemeral nature and modern messages. Blek le Rat is not a strategist, he is an artist of the highest caliber. However as we move closer to the new year, I can't help but wonder if he had some inkling of the impact he would have on the street art movement as a young man wielding a can of spray paint in the cold streets of Paris 30 years past, and if the culture's subsequent popularity was due in part to his prescience as much as his devotion to his craft. With high-profile patrons like Christina Aguilera and Shepard Fairey, Blek le Rat is finally attaining the recognition he deserves, as the forefather of what has become a worldwide movement of staggering proportions. Blek le Rat remains one of the most referenced artists by other artists, and his contribution to the movement legitimizes him in a way that media and critics simply can't. 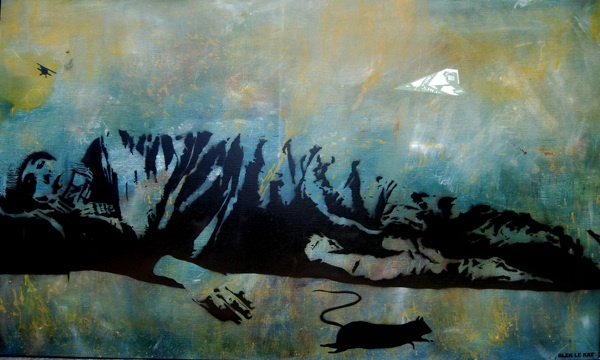 Fairey sums it up eloquently when he states, "Blek le Rat's stencils distill the essence of the human struggle into poetically concise images. Blek shows clarity in his work, he makes every stylized mark count, yielding art that is at once personal and universal, economical in gesture, and bountiful in statement." Blek Le Rat's 30th year as a street artist--working in a genre that is rapidly becoming one of the most important movements in art history--is also the subject of new retrospective book, documentary film, and the release of 25 new works by the artist in an anniversary exhibition title 60/30 at USA's 941 Geary Gallery. The artist will also be available through events, such as the much-anticipated book signing at the San Francisco MoMA on November 10, 2011. Blek le Rat's work can also be seen at Metro Gallery in Australia, Opera Gallery London, Opera Gallery Paris, Yves Laroche in Montreal, Jonathan LeVine Gallery in New York City, Jonathan Brandler Galleries in London, Samuel Owen Gallery in Connecticut and Queensland Art Gallery, also located in Australia among others. "I will never stop. Ever. Unless there was something wrong with my legs. But 30 years is a long time. It's a lifetime. This is my life." For more, see Blek le Rat's Facebook fan page.